High Security Outdoor Protection 10m range anti-mask/tri technology detection. The XD10TTAM is a high security outdoor detector from Pyronix, combining established and patented technologies such as Tri Digital Detection Signal Processing and Tri Anti-Mask Technology which have been adapted to enhance it’s performance in extreme outdoor conditions. 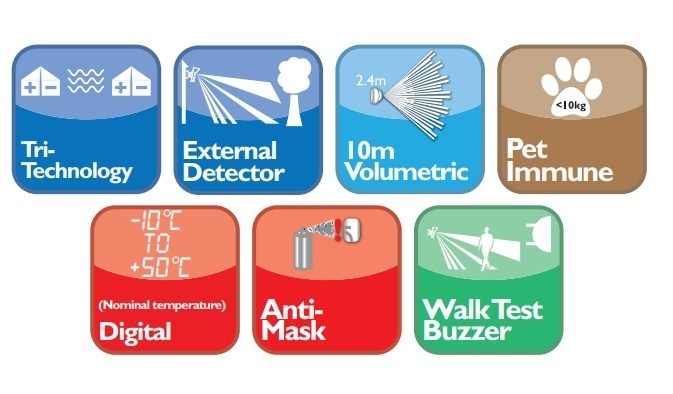 The range of XD10TTAM is determined by the combined range of the three detection technologies it uses that are two PIR sensors and one microwave detector. The microwave detector range is adjustable from 0m to 15m while the PIR range is fixed to 10m. The Tri Detection range is adjustable by changing the microwave detection range. In this mode the detector is installed at a height of 2.4m providing volumetric coverage of the area and animal immunity of up to 10kg. manufactured to high standards and coated with a heavy duty ultra violet filter to ensure their protection from UV radiation. Both, the hood and the back of the XD10TTAM are equipped with a cable channel, as well as a back wall tamper for added protection. The hood is fixed to the back of the detector to secure its high performance in any weather condition. The optional heavy duty tamper proof bracket consists of a cable through feature for easy installation and added security as the wires are hidden away within the bracket. 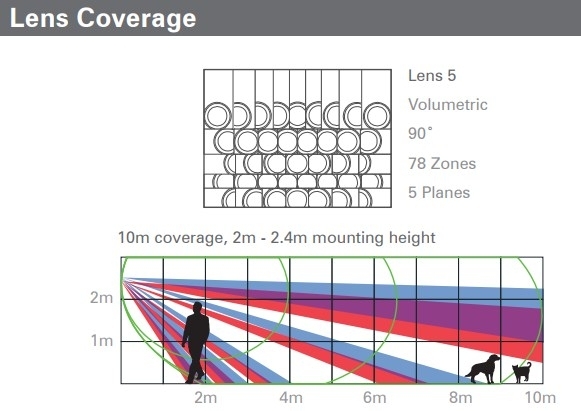 It moves 45° left and right allowing a total area coverage of up to 90° when two detectors are installed next to each other. If for any reasons the wire can not be hidden in the bracket there is the possibility to install a conduit to protect the cables. The fixed masking grid is used to create two non overlapping detection areas. This is recommended to be used on installations in extremely harsh environmental conditions where exposure to direct, low and bright sun light and reflections on snow covered surface is unavoidable. The adjustable masking grid allows the creation of targeted protection areas by removing strips from the grid. This allows the creation of: 1. Specific targeted detection areas 2. Further prevention from possible false alarm activations caused by swaying trees or passing traffic within the Tri Detection range.